There’s just something about the effect grilling has on meat that’s too delicious to deny. The process imparts loads of flavor that you cannot duplicate in an oven or on a stovetop. Then you layer on spices or tangy sauce and you have completely transformed a dull protein into a dish so tasty that your mouth waters from the mere thought of it. This is especially true for a blank canvas such as chicken. 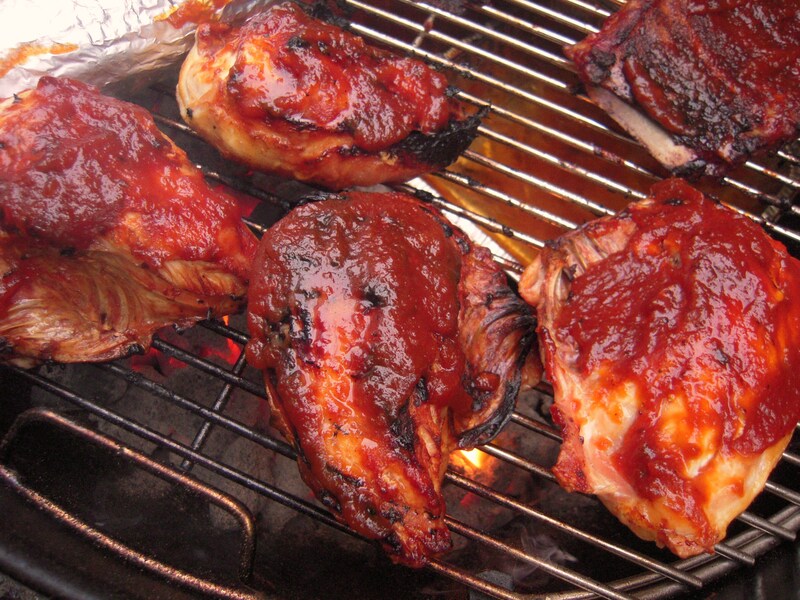 However, pulling off the best tasting barbecue flavors sometimes has nothing to do with a bbq chicken recipe. Instead, it boils down to picking out the best ingredients and employing specific cooking strategies. 1. The chicken comes first. If your budget allows for it, choose chicken that is antibiotic free, organic and/or free range. Also, fresh meat will end up tasting better than meat that’s been thawed. 2. Decide on the cut. Do you want pre-butchered pieces or a whole bird? Individual legs, thighs, and breasts will cook faster than a whole chicken. If you go with the pieces, be sure to buy them on the bone with the skin. These elements add flavor and will help prevent the meat from drying out. 3. Butterflying for better cooking. Butterflying or spatchcocking is simply splitting a whole chicken by removing the backbone (ask your butcher to do it the first time and watch so you can replicate it at home). This will allow you to lay the bird flat on the grill, increasing the surface area for a faster cook time. For super crisp skin, further flatten the butterflied chicken by placing a brick on top while cooking (just be sure to wrap the brick in foil first). 4. Create a flavor profile. Play around with measurements a little, tasting it frequently until you’ve tweaked it to your liking. Remember, chicken can take salt pretty well and the salt will enhance the other flavors. A lot of cooks forget this step, but you can shorten the overall cooking time by bringing the chicken to room temperature before placing it on the grill. Hint: Before going out to light the grill or fire up the charcoal, take the chicken out of the refrigerator. 2. Choose the heat method. If you’re grilling smaller pieces, such as legs and thighs, these can go over direct heat; however, if you’re putting a whole bird on the grill, you’ll get more even cooking with an indirect heat approach. 3. Add moisture once in a while. By squeezing a little citrus (i.e., lemon juice) over the meat once or twice while it’s cooking, you’ll be adding flavor and moisture. You could also try drunken chicken, which entails a full bird sitting on top of a beer can. Of course, this has to be done from the very beginning. It’s definitely hard to resist the urge to flip your meat often, but try! You’re not speeding up the cooking by extra flipping; if anything, you’re prolonging it. You’ll know it’s time to flip when you can easily lift the skin and/or meat off of the grill without it tearing. If it’s resisting, that means it’s not time to turn yet. Nearly all barbecue sauces contain sugar, which can burn easily, and that will cloud the barbecue flavor you crave. Save saucing until the last 15 minutes of cooking. At this point, it’s okay to flip more frequently so you can evenly coat all sides. The more applications of sauce, the thicker the glaze and flavor you create. 6. Test with a thermometer. Don’t just guess when the meat’s done, or worse, cut it open to check, which only ends up letting the tasty juices flow out. Use an instant-read thermometer. If it doesn’t reach a minimum 165º, let it cook some more. Once off the grill, let the meat sit. It needs a few minutes to allow the juices, which have been brought close to the surface while cooking, to settle back into the flesh. Even after 15 minutes or so, the chicken should still be hot. Next post: Does Green Tea Have Caffeine? http://www.kitchenmonster.com is a participant in the Amazon Services LLC Associates Program, an affiliate advertising program designed to provide a means for sites to earn advertising fees by advertising and linking to amazon.com.